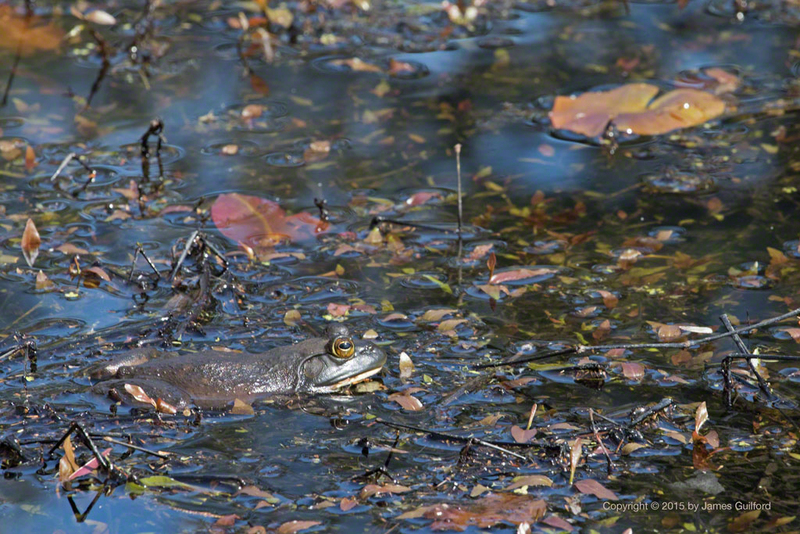 An American Bullfrog (Lithobates catesbeianus), waits. The weather hasn’t been very conducive to nature walks of late, that is if you don’t like getting stuck in mud! Over several recent days, however, there has been enough break in the rain to make trails more passable and skies a bit more cheerful. On a walk on the Buckeye Woods Park, Chippewa Inlet Trail we heard and encountered a number of birds I’d not seen before; most escaped my lens. 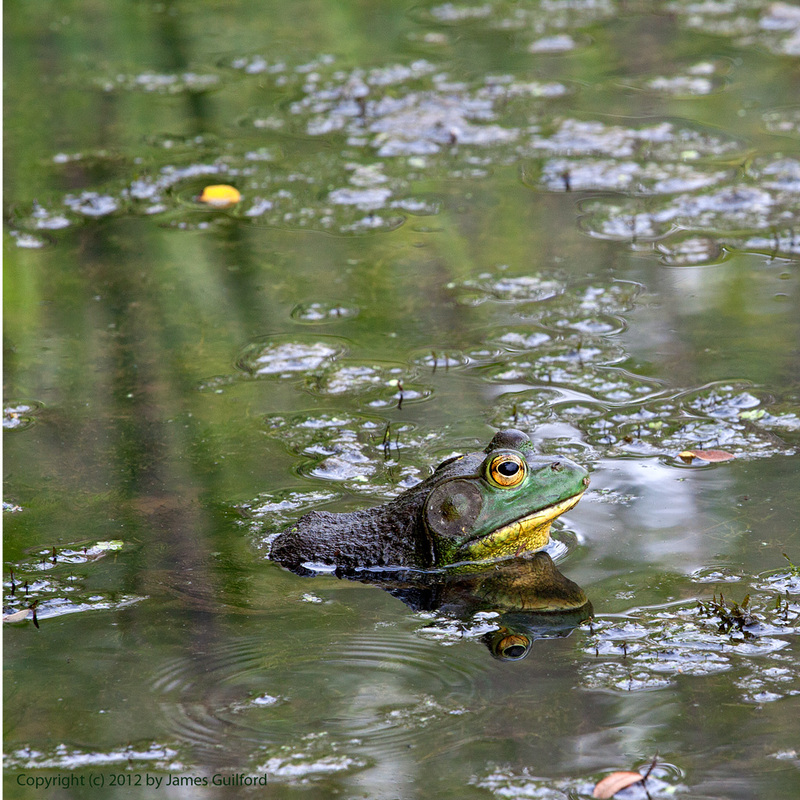 My shot of the day, however, didn’t bear wings: it was a common American Bullfrog (Lithobates catesbeianus). I was delighted by the position of the frog amongst wetland reeds and how the scene led from light to shadow — a beautiful arrangement. The frog, perhaps to avoid being noticed, held perfectly still while I photographed. I’m quite pleased with the results. On Memorial Day we visited the Sheldon Marsh State Nature Preserve — a spit of land in Huron, Ohio that extends into Lake Erie. Wetlands line the paved trail and the area, though small, provides habitat for many varieties of bird, and a rest and refueling stop for migrants. Bird songs filled the woods, and wildlife was easy to see, including two snapping turtles laying their eggs in holes they excavated along the paved footpath! My shot of the day at Sheldon Marsh was a beautiful female Red-winged Blackbird (Agelaius phoeniceus). The bird alighted on a low bush and furiously shook and preened itself while I watched and shot photos. Then, all sorted off, the blackbird shot into the woods to go about her business. It was wonderful, in the truest sense of the word, to get out and explore everyday natural beauties. At Lorain County MetroParks’ Schoepfle Garden last Sunday, I spied two snakes sunning themselves on the bank of a pond. The snakes became aware of me but unpanicked, moved into the water and away at a leisurely pace. As they submerged and wriggle-swam, the pair changed from dark and dusty — nearly black — to their true shades of brown, revealing beautifully-patterned skins. As the larger of the two reptiles turned to meet its (apparent) mate which had gone in the opposite direction, it passed by a large bullfrog. Wary of the possible danger the frog, though too large to be swallowed, held perfectly still as the water snake passed. Saturday, April 18 presented us with beautiful spring weather so we took off to see how the gardens, ponds, and woodlands at the Holden Arboretum were doing. Some garden paths remained closed for the season but we happily set off for higher ground and pools. 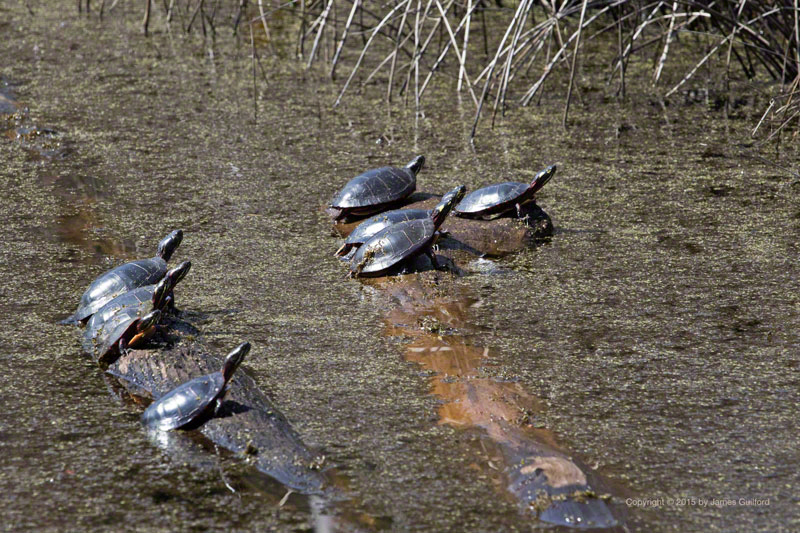 Bird songs filled the air as we enjoyed early blooms and emerging animals including: a water snake warming itself on a tree branch, clusters of turtles also catching some sun, a couple of bullfrogs, and three ( 3 ) dragonflies! We will visit there again, likely in May when sustained warmth entices more life into view. Though obvious in these pictures, quite a few animals can become invisible by matching their environment to their color. 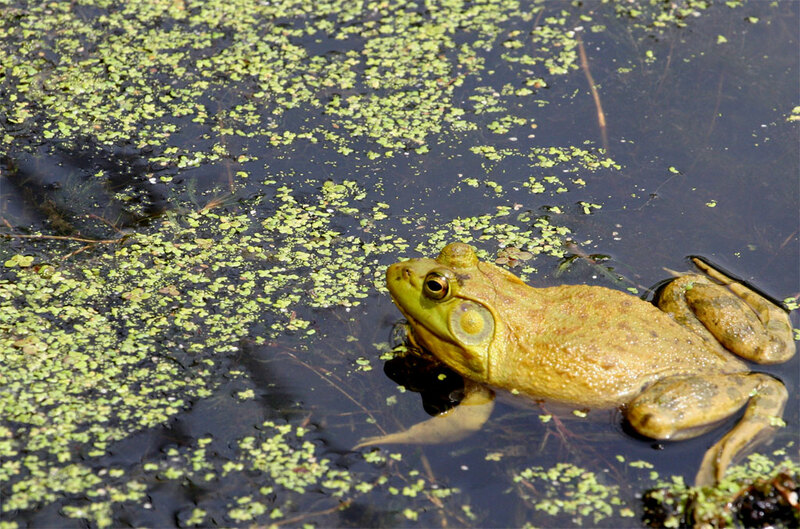 A bullfrog, waiting for prey to come a bit too close or for his own protection against predators, may sit quietly in duckweed. If the frog holds still enough, perhaps he will be overlooked and gain a meal or avoid becoming one. 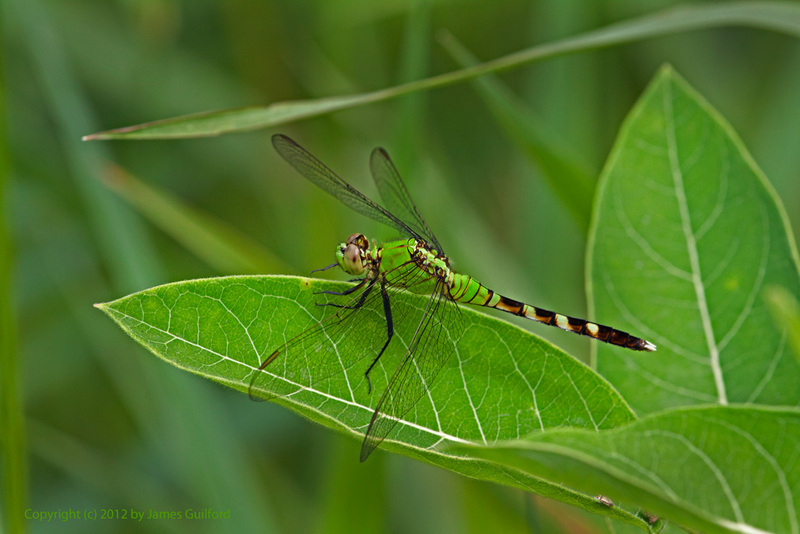 The green dragonfly, also a predator, has the same advantages if it alights among green plant leaves. 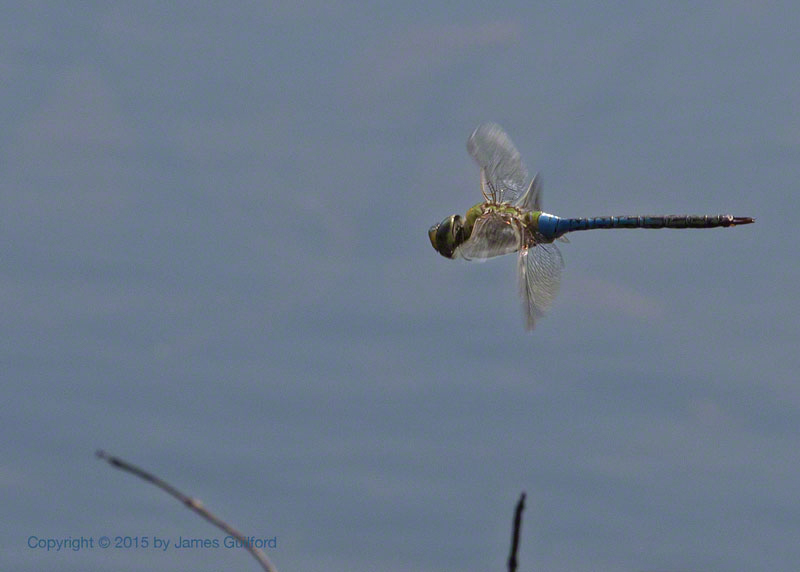 The dragonfly, by the way, was much harder to spot than the frog! These animals were spotted at the Columbia Reservation of the Lorain County Metroparks hiding in plain sight. American bullfrog (Rana catesbeiana) — Eastern Pondhawk Dragonfly (Erythemis simplicicollis) female. We spent the better part of the day Saturday (in a couple of aspects) hiking around Spencer Lake in the Spencer Lake State Wildlife Area, Spencer, Ohio. It was another photo-walk with many opportunities for wildlife shots. The red-winged blackbirds were out in force, several great blue herons were fishing the lake, and we even encountered a couple of frogs in an adjacent swamp area. One of the frogs was quiet (or stupid) enough to pose for photos including an amazing close-up. The Canon 70 – 200mm "L" lens is simply amazing and I can zoom in on the resultant frog portrait seeing greater and greater detail until it dissolves into pixels — and it was hand-held. We also visited the Medina County Park System's Letha House Park and checked out the work they are doing providing a new entrance drive and parking lot. 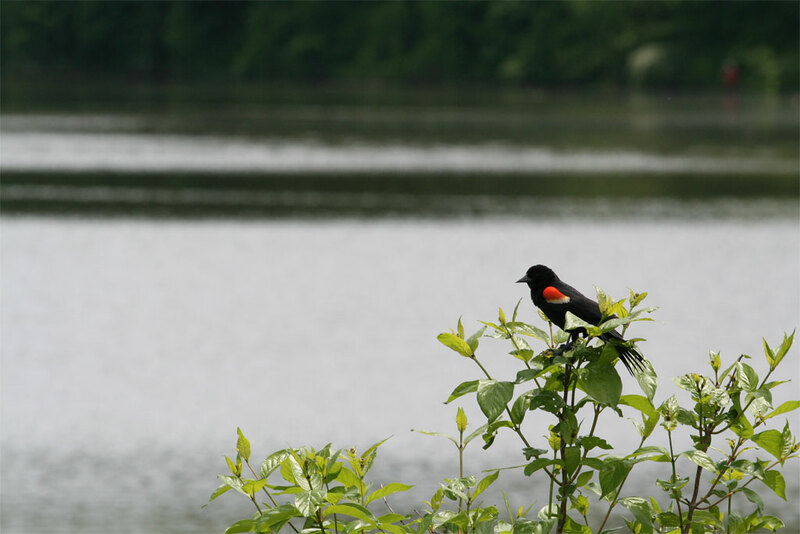 This will benefit visitors to the new lake there as well as support the Observatory built and operated at Letha House by the Cuyahoga Astronomical Association. A fine day but I didn't wear sun-screen and I'm a bit reddish… tsk! tsk!